Dazzled by open hearted Hawaii firefighter Vic Lazzarini, dispatcher Lizbeth dreams of romance with this Prince Charming she’s found after too many frogs. But a grisly crime in the gentle rain of a Hawaiian Valentine’s Day morning shocks her out of her fantasies and plunges her into the greatest struggle of her life. Part romance, part true crime, and all heart, Angel Hero is the memoir no one can stop talking about. A freelance writer since 1983, I credit my daily writing routine with enabling me to fulfill the vow I made to Vic’s spirit in 1985. “I’ll keep honing my writing skills,” I promised, “until I can craft such a compelling story people will clamor to read it.” I also vowed to tell the truth about the inspirational spiritual events that occurred. I kept those promises. However, for nearly three decades, I disguised what took place in the physical world of time and space as fiction. I wrote a dozen different versions of this story, most of them novels, one of them a screenplay. The last thing I wanted was for the gunman to discover what I’d written about him. The first version, which I called an inspired-by-a-true-story novel, was available on Amazon from April 2014 until October 2015, when I discovered the murderer had died. With the killer no longer a physical threat to me, I felt safe saying, “This is a true story.” To protect the innocent from the murderer’s family, however, I continued to fictionalize the names and dates in this true crime, true love, spiritual memoir. 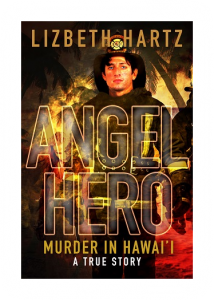 In July 2016, Kwill Books published the newest edition of Angel Hero. The story takes place on Oahu in the Eighties.